We have our own neon manufacturing plant, all our neon is manufactured in-house. We can also do your neon fitment. 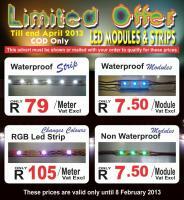 LED modules & strips also available & fitted.